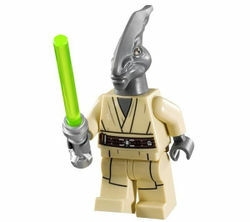 Coleman Trebor is a Star Wars minifigure first released in 2013. Coleman Trebor's leg piece is coloured tan, and features black and dark tan printing on the legs and the top of the hip joint, depicting the bottom of Trebor's Jedi robe. This printing continues onto the tan torso piece on both the front and the back. In addition to this, a dark brown belt is present on both sides of the torso, with black, silver and gold printing for features such as utility pouches and buckles. Dark grey hands are used to repesent Trebor's skin tone, and a dark grey area is printed towards the top of the torso on the front side at the opening of the robes. A specially moulded piece was made for Coleman Trebor's head- this dark grey headpiece with a sweeping head crest is based on a member of the Vurk species in the Star Wars universe. It has several features moulded into it, including a serious expression, areas for the eyes, nose and wrinkles. The eye areas feature some printing- tan with black irises. One accessory is included with Coleman Trebor- a green-bladed lightsaber with a silver hilt. Coleman Trebor was a Vurk Jedi Master who sat on the Jedi High Council shortly before the fall of the Jedi Order and Galactic Republic. He was more well-regarded for his skills as a diplomat and negotiator, and although he preferred to negotiate rather than fight, he was known to be a cunning warrior. Trebor's final mission was as a part of a Jedi task force headed by Mace Windu to rescue Obi-Wan Kenobi, Anakin Skywalker and Padmé Amidala. During the ensuing battle, where the Confederacy of Independent Systems deployed an army of Battle Droids, Trebor leapt up toward the podium occupied by the Separatist leaders in an attempt to kill Count Dooku. However, his attack was thwarted by the bounty hunter Jango Fett as he delivered several blaster shots to the chest. The corpse of Coleman Trebor tumbled off the podium and headfirst into the raging war several metres below. This page was last edited on 8 January 2018, at 01:34.